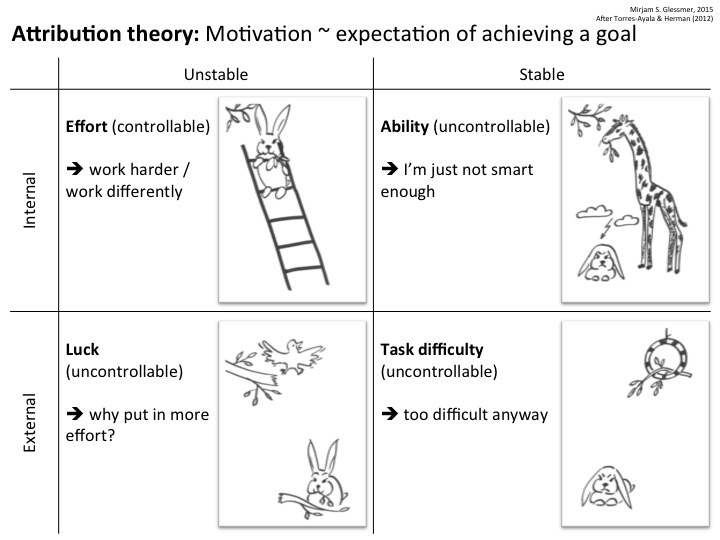 Last week we talked about motivation quite a bit: First about why do students engage in academic tasks?, then about how motivation is proportional to the expectation of achieving a goal. Today I want to bring it all together a bit more, by presenting two other theories (both also described in the Torres-Ayala and Herman (2012) paper, which — should you not have read it yet — I strongly recommend you look into!). 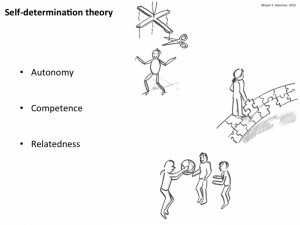 The self-determination theory describes three components of motivation: Autonomy (i.e. being able to determine what you learn, when you learn it and how you learn it), competence (feeling like what you are learning is giving you (more) options to achieve what you want to achieve) and relatedness (feeling connected to a group). 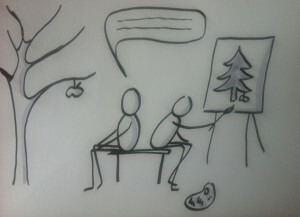 Those are all components that you, the instructor, do have some influence on. For example a feeling of autonomy can be fostered as easily as giving students the choice of three problem sets and asking them to choose the one they want to work on. 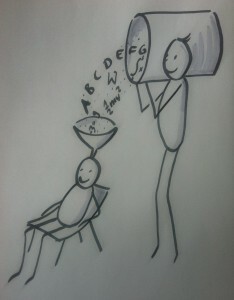 Or to let them choose the group they want to work with rather than prescribing groups yourself. Or even only letting them determine the order in which you talk about homework questions. 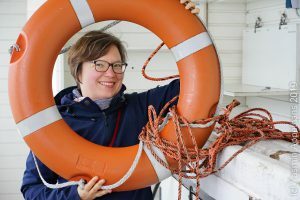 A feeling of competence is a little more difficult for you to influence, but can be achieved by giving problem sets that gradually become more difficult, instead of giving them really challenging problems right away. And a feeling of relatedness can be achieved for example by letting students choose who they want to work with, and by making sure you observe the group processes and intervene when necessary. 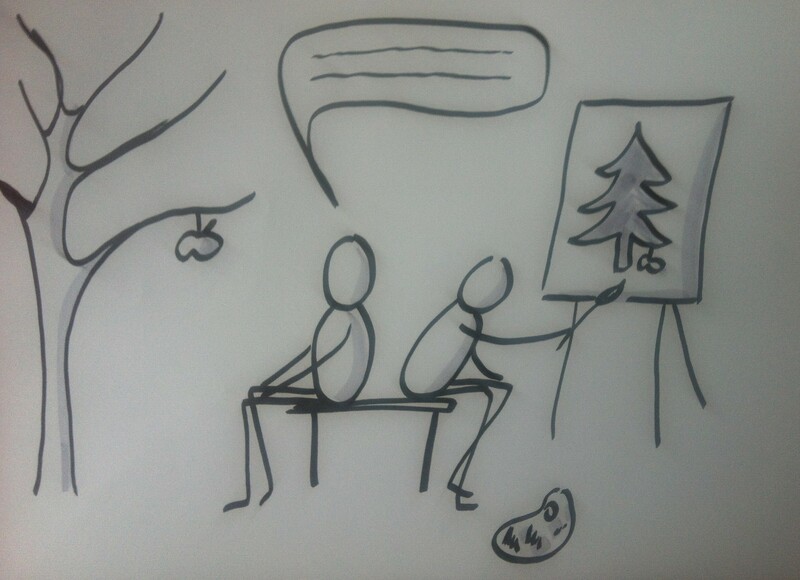 There is a fourth theory in the paper, that I also drew little pictures for, but which when preparing for my upcoming workshop for TU Dresden, I chose to drop for now. After all, there is only so much theory one can take in at a time, and I know that what the participants of the workshop come for are methods, methods, methods. Which I might actually give them! Anyway, I still want to look at the expectancy-value theory here. 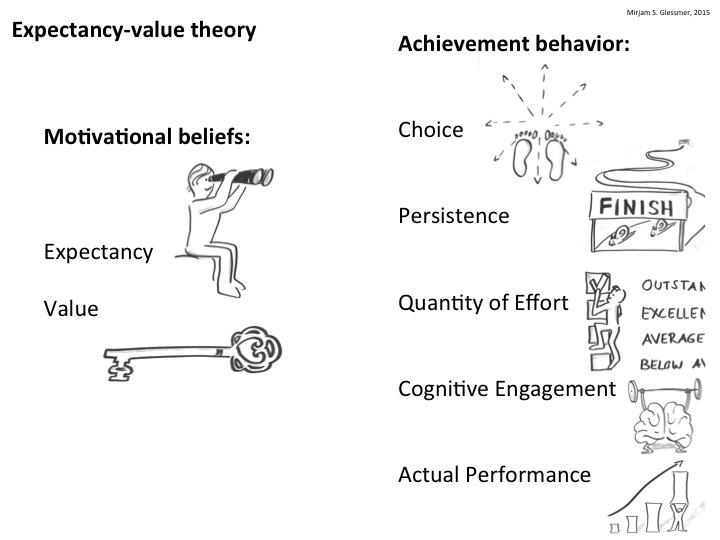 Expectancy-value theory basically connects motivational beliefs with achievement behavior. 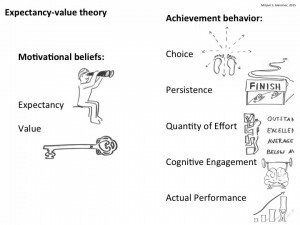 If you believe you can achieve your goal (expectancy) and reaching that goal is important to you (value), this will modify your behavior. For example, you will likely choose to practice more, and on harder problems than people who don’t have the same beliefs. You will likely be more persistent in pursuing your goal. The quality of your effort will be higher, your cognitive engagement will be higher, and your actual performance will also be better. There are a lot of studies that link student beliefs with their behavior, and I find this super interesting. I’ll definitely get back to reading and writing about this very soon! This entry was posted in literature, method and tagged literature, motivation, TU Dresden on September 21, 2015 by mglessmer. 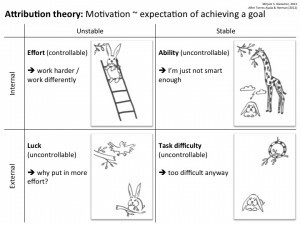 Motivation proportional to the expectation of achieving a goal? The most desirable one is one that places an emphasis on effort. Students believe that their chance for success is something internal and unstable, which means that since it is determined within themselves and is not fixed, it can be changed. So they know that if they work harder (or work differently), they can be successful. Since their fate is in their own hands, it is easy to be motivated to do your best. Other students focus on their ability. This is not desirable, because while they still perceive their chance for success as something that is determined within themselves, they also think that they cannot influence whether they are successful or not. They typically feel like they are not smart enough (or — almost as bad — that they are so smart that everything has to go their way, no matter how much effort they put into it). A third group of students focusses on task difficulty. Task difficulty is obviously determined externally and is stable – students are likely to feel like the exam was too difficult anyway and they had no chance of controlling whether or not they would be successful. And then lastly, students that feel that their success depends on luck. Luck is also external, and it is unstable. They don’t know whether they will be lucky or not, but in any case they feel like there is no point putting in an effort. How does knowing about attribution theory help us improve our teaching? When we know that students are basically only motivated when they feel like they have a direct influence on whether or not they will be successful, we should try and create an environment where learners do feel like that. That means fostering a growth mindset, i.e. not focussing on student abilities, but making sure they realize that they can learn whatever they chose if they put in the effort. It also means making sure that students can rely on the environment being exactly like you said it would be, meaning that if you say you won’t call on people which didn’t raise their hands, you can absolutely not do it. And it also means that students cannot get the impression that you favor some over the others, or that your mood and your grades depend on the weather. Lastly, it means that the task difficulty has to be appropriate. Some challenge is good, but if students don’t have a chance to succeed, they will not continue trying indefinitely (in fact, most quit a lot faster than expected). And who can blame them when their chances of success aren’t more or less proportional to the amount of effort they put in? This entry was posted in literature and tagged literature, motivation, TU Dresden on September 16, 2015 by mglessmer. Motivation: dangle a carrot rather than threaten with a whip! 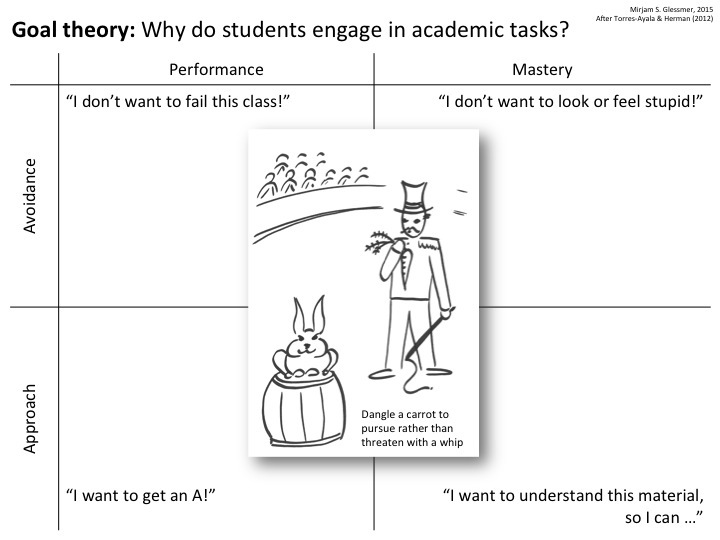 Why do students engage in academic tasks? 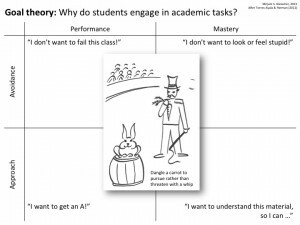 Goal theory describes the different reasons why students engage in academic tasks. There are two different kinds of drivers students can have, avoidance or approach, and two kinds of quality of learning they can be striving for: performance and mastery. Students who are in a state of avoidance and look for performance will state something like “I don’t want to fail this class!”, whereas students in avoidance striving for mastery will say “I don’t want to look or feel stupid!”. Students with an “approach” attitude, on the other hand, will say “I want to get an A!” if they are aiming at performance, or “I want to understand this material, so I can do … with it”. While all four kinds of motivation for learning will produce some kind of learning, students with an approach mindset striving for mastery will be the most intrinsically motivated students who will likely do best. So what does this mean for your teaching? Making students learn to avoid repercussions or public shaming, hence driving them into an avoidance mindset, is not as effective as creating a learning environment where students work towards something positive. And while having students work to earn, for example, bonus points gets them going in the short run, in the long run it is much more effective to help them discover what they can use the skills and knowledge for in their own lives for, discover the intrinsic value in them, and strive to learn because they want to apply the knowledge and skills to better their own future. Or, as the authors say: Dangle a carrot to pursue rather than threatening with a whip. This entry was posted in literature and tagged literature, motivation, TU Dresden on September 14, 2015 by mglessmer.